Sport Court UK are leaders in the design, construction and installation of luxury residential sport courts. Fully customised multi-use family games areas uniquely tailored to you and your home. 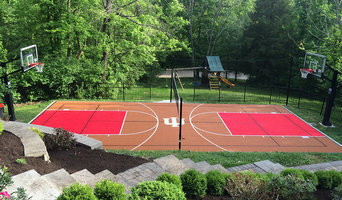 From small basketball shooting zones, to full size tennis, Sport Court UK’s modern, multi-sport courts transform homes into hives of healthy activity. Create more quality time at home with a low maintenance residential game court installation. Provide your family the high performance of a FIBA® approved basketball court, NCAA® volleyball court, or USTA® tennis court. Together with our in-house design team and in partnership with architects and project managers, Sport Court UK provide complete court building services from initial site survey, court design, construction and installation of key court components. Sport Court® PowerGame modular sports tiles are the Safest Court in the World™. Designed for athletes in conjunction with leading global sports organisations including NCAA®, USA Volleyball®, USTA®, FIFA®, FIVB®, FIBA®. Sport Court®, founded in 1974, are manufacturers of the original modular sport surface, continuously improved and patented to provide the highest levels of quality and performance. The official court of backyard fun™ with more than 150,000 global court installs. 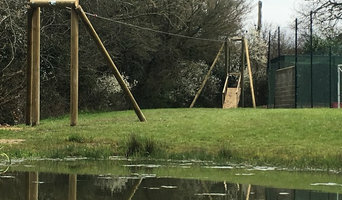 We design,manufacture and install high quality wooden climbing frames, tree houses and zip wires for both private and commercial customers across the South of England and Wales. We also have installers in the North and Midlands of the UK as well. Professional line marking experts specialising in the application of epoxy paint, acrylic, Multigrip and Courtcote markings. For a more grown-up play area, a tennis court, netball court, basketball court, or any other sports court, is a great way of utilising outdoor space to exercise, practice your hobby or start learning a new sport (in the privacy of your own home!). Tennis court construction in Itchen Abbas, Hampshire doesn’t have to be as cumbersome as it sounds when you hire a sports court designer. They will handle all of the design, logistics and tennis court installation, liaising with you every step of the way, in order to put together your dream outdoor sports area. Why would you need to hire an Itchen Abbas, Hampshire sports court specialist? Tennis court installation can be very technical; there are many materials, measurements, specifications and technology to consider and it is not a project to take on lightly. The same goes for other sports courts such as netball and basketball courts, football pitches and golf courses, but by hiring an Itchen Abbas, Hampshire professional who is experienced in sports court construction, you’ll feel much more confident when building your outdoor sports area. Hiring an Itchen Abbas, Hampshire tennis court construction or other sports court specialist who has worked on similar projects to yours is always important, but with sports court builds it is especially essential as it means the professional will be familiar with national regulations, standards and rules for tennis court installations and other sports fields. If you want to give your children a place to play that rivals the local playground, then you can talk to Itchen Abbas, Hampshire playground designers and contractors who can provide you with playground equipment and will install a fantastic playground design catered to your children’s requirements and preferences. A playground designed by a professional will be safe but fun, and will usually outrival any shop-bought climbing frame or higgledy-piggledy DIY play area. Why should I use an Itchen Abbas, Hampshire professional to build my treehouse? What questions should I ask an Itchen Abbas, Hampshire sports court or outdoor play equipment designer? Narrow your search in the Professionals section of the website to Itchen Abbas, Hampshire sports courts or outdoor play equipment. You can also look through photos to find examples of Itchen Abbas, Hampshire tennis court constructions, playground designs, treehouses and climbing frames that you like, then contact the contractor who worked on them.